This morning the farm crew was breaking up large bunches of parsley into smaller bunches, so all shares would get an equal amount. Sadie found a green hitchhiker in one of the bunches, and set it aside for me to photograph. She was very excited to find it. 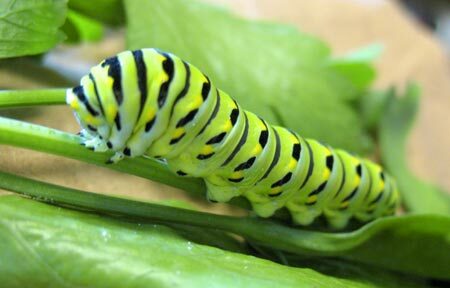 There’s a lot of speculation whether this is a swallowtail or a monarch caterpillar. Any ideas? so funny , check my latest blog post ! It’s swallowtail season! This particular caterpillar came over all the way from Punta Gorda in a tote full of parsley loaded in a reefer truck. Talk about tough! Sadie put it out by the compost pile where it can munch to its heart’s content. Also Monarchs and Queens have black “antennae” on one or both ends.